I first heard that Avis had dumped its classic tag line when I read Mickey Lonchar’s perfectly titled post, Avis Quits Trying Harder. Who didn’t love We Try Harder, and the case study that goes with it? The early ads said “We’re Number 2. We have to try harder.” In fact, they were only #2 in a technical sense. As of 1962, they had not made a profit in years. But Avis’ market share and profits shot up dramatically with that brilliant campaign. Why did Avis abandon the iconic line in favor of the less compelling “It’s Your Space”? 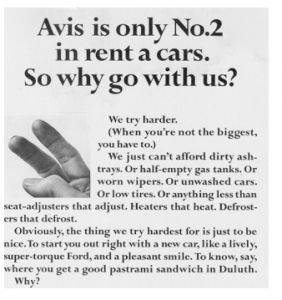 I speak as a person who spent 13 1/2 years in four advertising and marketing positions at Avis, ending in 2001 when it was acquired fully by the now dead-as-dodo Cendant… I know quite a lot about how Avis got to ‘We try harder’, what it meant to the company through many ownership changes, and how ‘We try harder’ (WTH) evolved in the time I was there. Since I left car rental eight years ago, I pay little attention to the sector. I’m now just a normal occasional renter without any particular loyalties to any brand. But this change hit a nerve–as a professional marketer with a keen interest in positioning, and also as a former Avis marketer who has some pride in her and her former colleagues’ work there in the past. So you can look upon the following critique as either pertinent and smart, or the ramblings of someone nostalgic for her past and out of touch with the current frequent car rental user. Topline: IDIOTIC. FOOLISH. Just toss away 50 years of equity and positioning. @ Will, a botch. We Try Harder was always aspirational in two ways. We promised a benefit to the customer that we would work our tails off for them to have a clean, ready, good car at the minimum and yes, much more than that as we shaped it later. It was there for us to live up to operationally and it was 100% customer-focused. Internally, it gave us a standard to achieve thru the organization; I know since I was familiar with customer service training in many different areas. It’s also a bar that was constantly being raised. As a marketer, with this kind of positioning, I had to be careful not to over-promise–but I had great consumer, travel agent (remember them?) and employee stories to tell. WTH was shapeable. We could introduce new features and services easily–because we were always trying harder to please the customer. WTH was timeless and STRONG. There is never anything dated about happy customers. It also said what we did and why we were different loud and clear. WTH translated well internationally. I know because I dealt with that market too. And yes, @ Paul, the company has strayed far operationally from fulfilling WTH. In my day we were #1 in JD Power and a finalist for the Malcolm Baldrige national quality award. Their new CMO (one year) is out of American Express and their new agency is Leo Burnett Business. Draw conclusions as ye may. Great points, huh? Here are some takeaways for any business. We Try Harder was strategic more than clever. It had the ring of honesty. For customers, it’s a promise of value – a value proposition. For the organization, it’s a brand mantra – a rallying cry, a manifesto, or benchmark for measuring every decision and action that affects the customer. Avis will now spend millions to imbue meaning into the bland “It’s Your Space,” which is more about the commodity than the spirit of the company. Instead, a campaign to reclaim the spirit of We Try Harder might have rallied the brand. Many marketing agencies, upon taking a new assignment, will automatically recommend dramatic changes to logos, tag lines and other brand identity elements. Sometimes it’s the right call. But I suggest a little caution when certain brand elements have so much built-in equity. There’s no better foundation for your marketing messages than a carefully crafted and compelling company story. Yes, you have one, though you may not be telling it. Or you may not have crafted it yet. It may be about the problem you solve, your history, your motivation, your dedication to your customer. The more customer-centered, the better. Is there any better story in the history of advertising than We Try Harder? Maybe not. I wonder if Avis didn’t try hard enough to tell their story in recent years. What do you think about Avis changing its tag line, or about the lessons it holds for other businesses? This entry was posted in Communication strategy, The ad business and tagged Avis, cleverness in advertising, company slogan, customer focus, Donna Cusano, tag lines, timeless slogan, We Try Harder by barrett. Bookmark the permalink. Barrett–thanks for your contribution to this debate and the quotation. One of the more compelling parts of the original Avis WTH ‘story’ is that Bob Townsend, CEO at the time (1962), delayed the introduction of the WTH campaign for months until the company achieved clear operational and customer service goals consistently and at every location to fulfill the meaningful points of the campaign. Would a company do that now, I wonder? I will add another part of a later posting, rebutting someone who insisted that WTH was an obsolete tag line, but also with the consideration that Avis performance may have strayed: ” @Jim, WTH was never just a tag line or clever campaign like Brim or Pepsodent or VW ‘Think Small’ (which was something more), and that rightly belong to the past. I believe I made the point above about how it uniquely worked within the organization to set a performance standard and set the relationship with the customer. It also proved to be quite adaptable over the years and I pointed out the great revival when the company became an ESOP. As someone who was in marketing and advertising for the company for 13.5 years, it does make my heart rather sad on how the company has lost its way and leadership since the HFS/Cendant acquisition. If you look back in Avis’ history (go to Wikipedia) you’ll see how many owners Avis had over its history, and there were plenty of times it lost its way between Townsend and the ESOP. I worked for the company at largely a fortunate time. Even the logo itself (which is newer–1980s and refreshed in the 1990s) got blanded out. You’re passionate about this Donna, as well you should be. “We Try Harder” was more than a line, it was an identity. And it served the company, and you, very well. I think you don’t throw something like that away, you build on it.